After the frenzy of punditry concerning Janus v. AFSCME, the actual decision today could well have been anticlimactic. Yet the Supreme Court’s unexpectedly broad ruling means not only that no teacher will be required to contribute to a union if he or she chooses not to be a member, but also that unions can no longer automatically enroll teachers. It’s a decision that is a genuine sock in the gut to unions’ business model. Even well before before the ruling was handed down, we’d gotten a good preview of how unions plan to respond to the new world order. One smart strategy has been to create a veil of destitution. The National Education Association cut its budget by $50 million, and its star performer, the California Teachers Association — ground zero for potential impact — slashed its own budget by $20 million. CTA takes in 10 times that much annually and has several hundred millions in reserve, but it’s best not to let teachers think it is awash in cash and not in need of their money. Another strategy is an increased level of activism, as unions remind their members that they have their backs. That’s why, without a doubt, the back-to-school season will also mean back-to-strike, as unions hope to recover some of the momentum of last spring’s successful job actions. Provided the unions don’t overplay their hands, it should be an effective ploy, since teachers still look to unions to bargain for better pay. Teachers also look to unions to defend them against accusations from schools, parents, and students; for that reason, school districts should expect to see local unions become more vigilant on grievances. Although the ruling makes it clear that teachers must affirmatively opt in to membership, unions will still find new and creative ways to make it easy to join (hold out for the free gift cards!) — and exceptionally inconvenient to leave. For example, New York passed a law, which the decision presumably does not nullify, that requires districts to notify the union within 30 days of making a new hire, along with providing contact information and even the best time for the union to get in touch. But while these strategies may solidify the base, they may not be enough to keep most teachers in the fold. Teachers unions have already experienced a roughly 10 percent decline in membership over the past couple of decades, and several independent surveys report that only half of teachers see their union as “essential,” that many find their dues too high and their political activity too leftist, and that they do not share the unions’ position on many education issues. 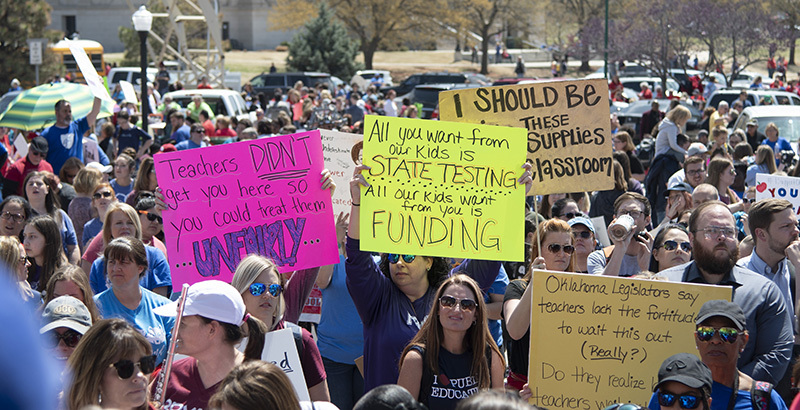 As much of this disenfranchisement skews toward younger teachers, the unions may have to prove their relevance by considering a number of moves that do not come naturally to them. What sort of positions ought the unions reconsider? Probably not their opposition to charter schools, even though younger teachers seem to have no problem with charters, because that position is not going to drive membership down. But others, like the stringent defense of ineffective teachers, protection of seniority privileges, and an anachronistic pay system, are issues that are more personal to teachers — ones with which they have had firsthand, and often quite negative, experiences. More than half of all teachers think too many colleagues who ought not be in the classroom are still there, courtesy of their unions. Nothing drags teachers down more quickly than having to work alongside peers who don’t do their jobs well. But with the NEA and the American Federation of Teachers together contributing more to American political campaigns than any other organization or corporation, they’ve been a key part of ensuring that in the majority of states, instructional ineffectiveness is not explicitly articulated as grounds for dismissal. This makes it nearly impossible for a district to fire a mathematics teacher who just happens to not be very good at teaching math. When former teachers cite poor working conditions as a reason for leaving the profession, they generally aren’t referring to unclean bathrooms, but having been surrounded by teachers and leaders who defeat any notion of collegiality. Most teachers also recognize the harm inflicted by seniority rights that unions go to the mat to protect. They were themselves novices once, handed a class or assigned to a school where no veteran teachers wanted to be. Nearly 7 out of 10 younger teachers, closer to the experience, see the damage caused by inflexible seniority privileges, but even a majority of older teachers view them as harmful. It’s understandable how unions painted themselves into this corner, taking their obligations to the extreme, with no money worries to stop them. Today’s ruling certainly means big changes for how unions collect revenue, but the impact on the bottom line doesn’t have to be catastrophic. It’s time for teachers unions to decide: Do they double down on the old rhetoric or bring their stances in line with the beliefs of the 21st century teacher? Unions can continue to defend the few, but it might come at the literal cost of the many teachers who fail to see enough value in unions to continue paying their dues.